Sleeves too short, shirts too big, it’s such a chore when you’re bigger than the average person. So, what’s the knack to dressing well when you’re tall and thin? It’s a problem I’ve coped with since my adolescent years, where people would playfully nickname me “the shrimp”. How to dress with an athletic build ? When you try on a shirt or a jacket, either it’s often too big and floats around the correct size, or it fits but the sleeves are too short. When you try on a pair of trousers, it is either too short or the size comes up too big. As in all the other BonneGueule articles regarding awkward body types, I must tell you a little bit about retouching and trying things on. Always try things on! You can’t trust the sizes indicated on the tickets, which don’t reveal the cut of the clothing. For example, a shirt has many factors to consider: the neck, the width of the shoulders, etc – the only information that sizing doesn’t tell you is if the shirt will be suited to a rugby man, or to a long distance runner. Retouching a piece of clothing can save the day. I’ll go into more detail of the possible retouches you can do item by item a little further down into the article. The most important thing: choose clothes that fit you well. A shirt that floats around your torso doesn’t hide how thin you are, but in fact draws attention to it; here where an item is better fitted and the right size will look much more flattering. If you’re not 100% sure on a pair of jeans or a jacket, check out the guides item by item that you’ll find in the list of the best articles on how to dress as a man. There are loads of little tricks! To start, here is an example: the least successful outfit you could go for would be the suit combo, tie and striped shirt, the whole thing without a belt. Why? Because the linear style of the outfit draws attention and makes it seem more vertical. The lines slim down your figure and highlight the impression of a “Mikado stick”. The jacket. An obligatory item for the tall and thin, it outlines your shoulders really well, by structuring the height of the body. You need to choose it well, being particularly demanding about the fit, as the majority of jackets don’t sufficiently fit tall and thin bodies well. If you want to find out more information, read our post on how to choose a jacket. 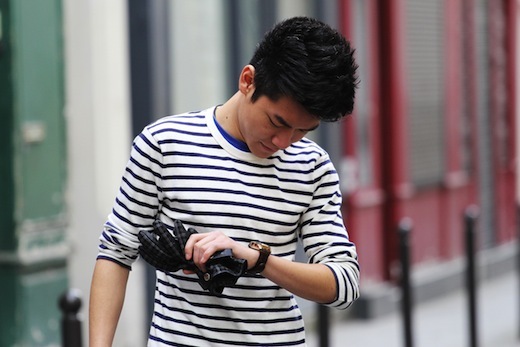 On t-shirts and jumpers, go for horizontal stripes, which visibly enlarge the chest. On casual shirts, simple, well worked chest pockets thickens the torso, and shoulder pads make the shoulders seem bigger. 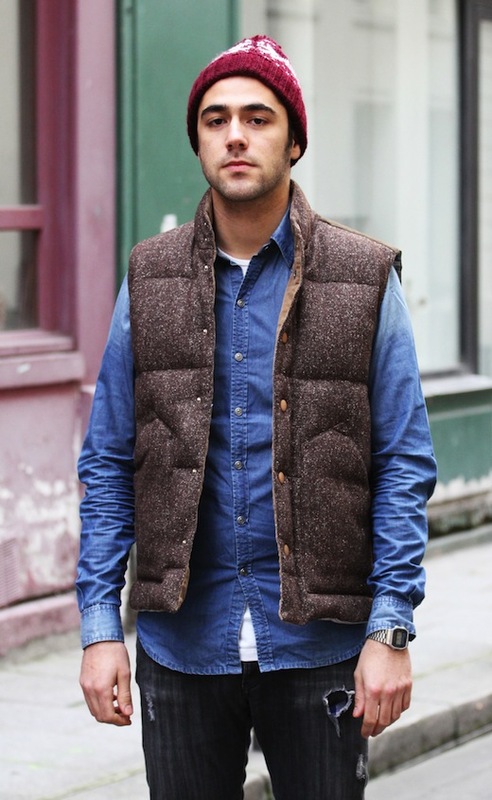 Layering is also another great idea, with a t-shirt and a shirt, or an open cardigan on top of a shirt, for example. In terms of accessories, a nice belt in a light color will noticeably break up a slender frame. Whereas a chunky scarf visually exaggerates the shoulders. 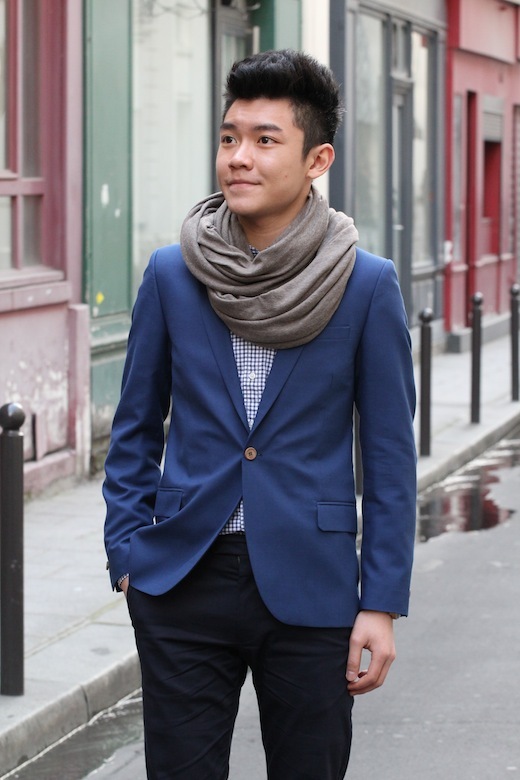 A pocket-handkerchief attracts the eye, thus stopping people from looking at your figure up and down. Finally, the lapel or hemline of your trousers stops your legs looking too long (avoid this if you’re short). In this photo, you will find all of these tips: an imposing collar and scarf, which defines the shoulders well, a hemline on the jeans and the high rise shoes break up the verticality of the figure. Adjusted cuts in ready-to-wear entry level. The mass, ready-to-wear brands have a habit of juggling hundreds of models by season (even by month), and for them, it’s not a worry to develop a line dedicated to “slim fit” clothes. Almost all chains (H&M, Mango, Zara, Gap, J-Crew, etc.) offer adjusted cuts. We’re talking about slim cut, adjusted or fitted, sometimes even extra slim, etc. On the other hand, these terminologies are mishmash, so it’s important to always try things on before purchasing. Don’t rely on the labels and sales assistant language! Asos and Topman equally offer a wide range of cuts, sometimes with deliberately long t-shirts. The brands of designers only rarely offer numerous cuts to their products. As a result, if you aren’t in the right shop, you’re done for. 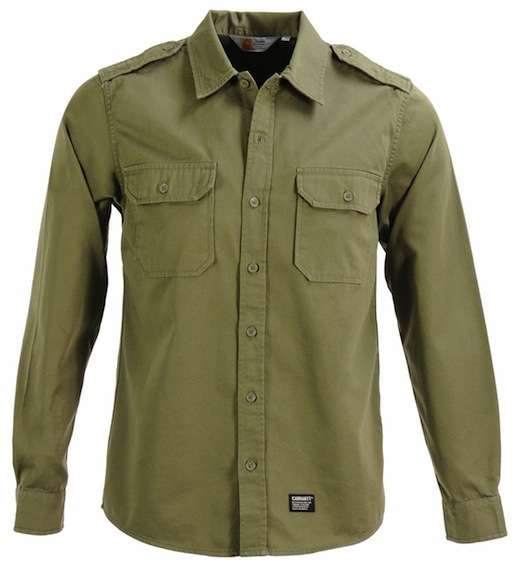 La Comédie Humaine produces well-adjusted jackets and shirts, notably at arm level (and around the thighs). 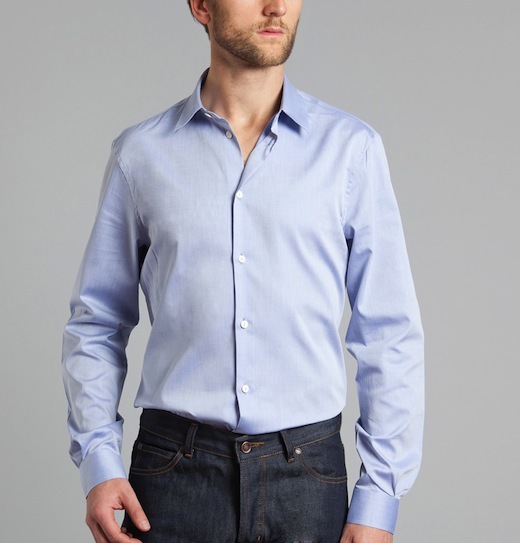 De Fursac corresponds well too, and produces une coupe de chemise that fits well without a problem. In general, Scandinavian brands (Acne, Fillipa K, or even SuitSupply) produce longer clothing, no doubt accommodating longer physiques. 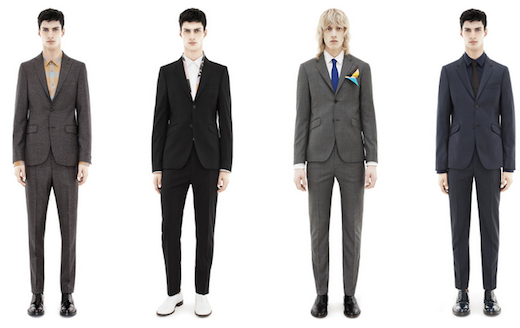 A screenshot taken from Acne’s webpage, all the mannequins are perfectly svelte. Pay attention; don’t become obsessed with the length of your sleeves because if you start to wait around to find the perfect item, you’ll be waiting around a long time. When you buy from ready-to-wear, keep in mind that according to your budget and what is on offer, you must make compromises. On the other hand, if you’re less than 6ft, in the majority of cases this won’t be too visually shocking (you’ll be the only one to notice it). 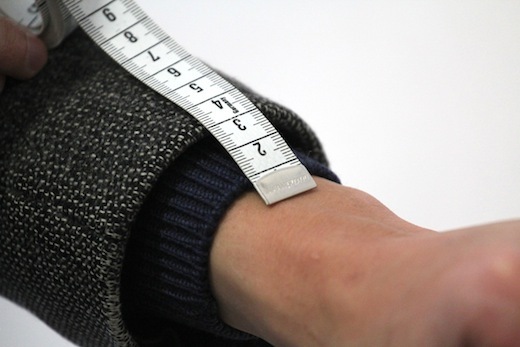 For a jacket or a coat, it’s much easier to adjust the length of the sleeves than to take in the shoulders and the fit. In general you’ll find 3 to 4 cm of excess material in the on the sleeves of a coat or jacket. You’ve thus earned 2 to 3 cm of length, and visually, it’s enough to make a real difference. A tip when purchasing: if the shoulders look good and the fit is ok, but the sleeves are a little bit short, think about having it retouched. It wouldn’t cost any more than $20. For a shirt: Clearly, it’s impossible to extend sleeves (yes! We haven’t quite invented scissors to re-add fabric). However, if you find a shirt where the sleeves and the shoulders fit you properly, you can adjust the size in adding darts. It’s a simple task: refold the excess fabric towards the interior of the shirt and stitch. 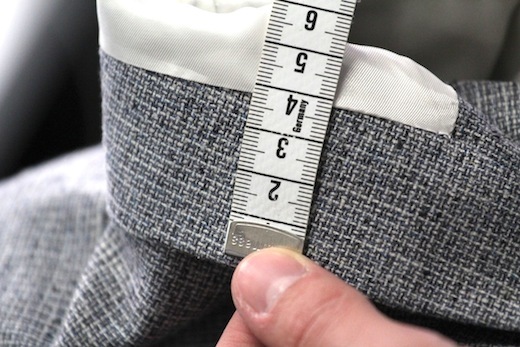 For trousers: Retouching the size and taking it in is a simple operation. Technically, it is possible to buy a pair of trousers larger than normal and take it in. Yet as a result, you will need to refine the legs, depending on how narrow it is at the bottom. It’s clearly much easier to extend trouser length than to take in the size, unless generally there is little material on the hemline. We have the same problem with the sleeves of a shirt, check it for yourself. Brands that specialise in a specific kind of item often offer a wide range of cuts and combinations of sizes, two things that brands which produce a complete wardrobe ne se permettront pas de proposer. 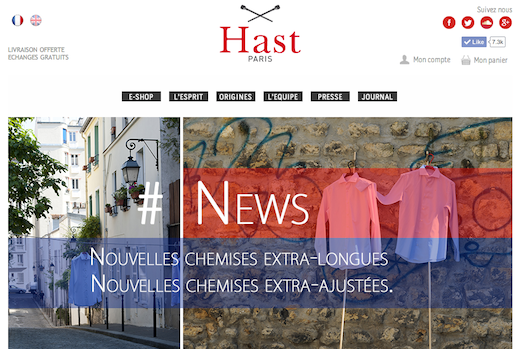 For shirts: Hast is a good example with three cuts: normal, extra long sleeves and super slim fit. In the UK, the shirt maker TM Lewin equally produces a range of different cuts. For jeans: Nudie is a really good brand that provides the maximum range of cuts in the maximum size range. 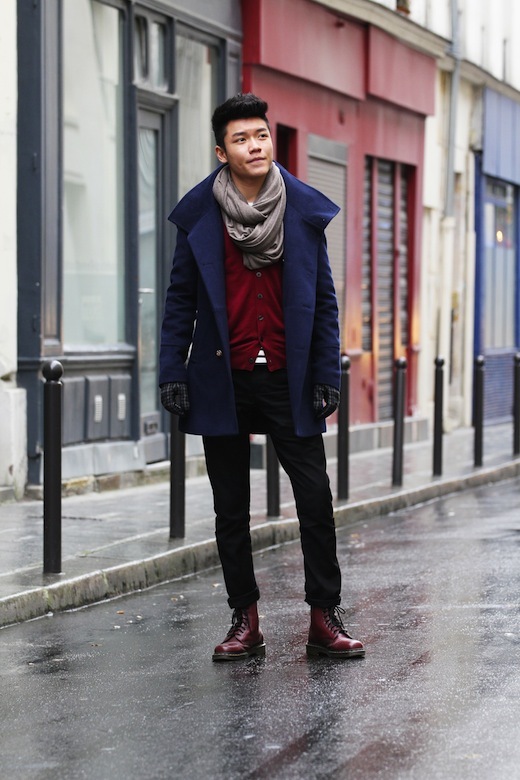 You’ll strike lucky here, notably with slim jeans in a smaller size, but that are very long. Unisex jeans, such as APC ou April 77, can also work really well for you. 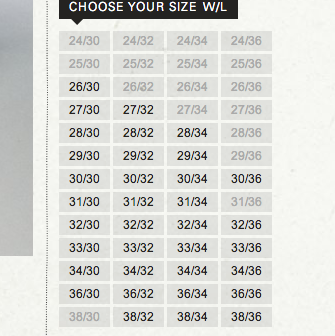 Size chart for Nudie jeans, notice the striking number of combinations. On the other hand, to my knowledge, there isn’t a brand that offers the equivalent in jackets… It’s for this reason that we’re going to talk about… half-measure. It’s an offer distinctly underestimated by the body types of readers, from baguettes sticks to sushi rolls. You can get everything you want there: shirts, trousers, and of course, jackets and suits. 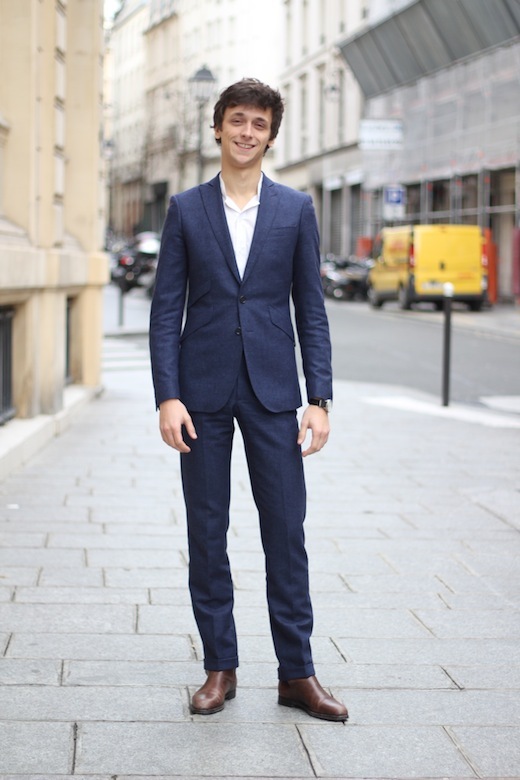 Here is the review of a custom suit by Black Lapel. The only thing to watch out for is going for brands that have a habit of fitted clothing. Certain custom made brands have a more modern style than others, and it’ll be better for you to go for a brand where everything they produce corresponds to what you want. My half-measure suit by Samson, notice the lapel at the bottom of the trouser. To sum up: think about adding a sense of horizontality to your outfits. Look for brands where the lines correspond to your build. Always try things on. Know that retouching can save the appearance and finally, consider made to measure. Given that I’m tall and thin with the body of an asparagus, I’d love to hear your thoughts and suggestions (on the other hand, in the morning, my hair resembles little that of an asparagus! ).